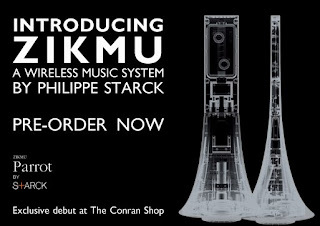 The French mobile technology firm Parrot has introduced Zikmu, a wireless speaker system designed by Philippe Starck. The 2.5' speakers have immediate style impact while maximizing the listener's auditory experience when seated on a (hopefully) suitably stylish sofa. 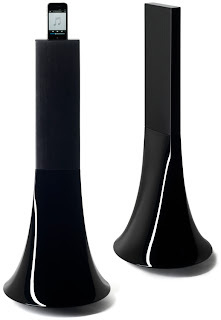 They remind me of Starck's iconic miss k lamp and they'd fit well with the miss t stool in my imaginary übercool condo. Controlled by the Parrot by Starck smart remote control, it works with an iPod (not included) to provide surround sound anywhere in your living room. 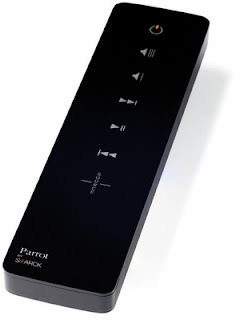 It can also stream audio from your mac/pc using bluetooth technology. 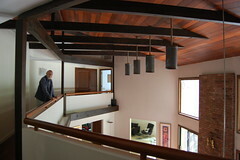 Price: $1,600.00 not including delivery. Exclusively from The Conran Shop from May 15th. My sentiments exactly. I am sure my husband would drool over these! I'm pretty happy with my portable ipod speakers for $150. Not as cute, true, but a lot easier on the budget. Have you ever seen the cardboard ones MoMA sells?